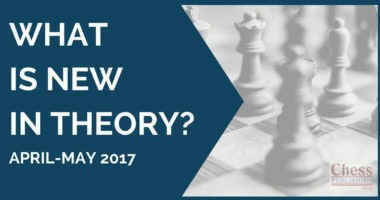 Our columnist offers a glimpse of developments in theory from ChessPublishing.com-Ed. Indeed, that’s what we are going to do this time. While I was looking at Mikhalevski’s column on open games I was struck by the following position in his notes to e4 e5 chapters. Quite a dangerous position! But Steinitz would have loved it. Indeed, the position has been known since 1906, if not before! Now in the game Harikrishna-Aronian, Wijk-aan-Zee 2014 Black played 12…Qf8 seeking exchange of queens and it was a draw. Mikhalevski mentions 12.. c5!? and this deserves attention. Interesting stuff! 12…c5!? needs more tests over the board. Among other updates the delineation of 6.h3 in Najdorf Sicilian by Michael Roiz is worthy of attention. I was a bit sorry to see Shirov at the receiving end in some of these games. But then he is always exciting to watch, win or lose. For quite some time I have been interested in offbeat lines in Dutch Defence. When I examined the ebook from the site I was amused to find the following line in which White can lose after four moves! 1.d4 f5 2.Bg5 h6 3.Bh4 c5!? More updates with novelties from World Rapid and World Blitz Championships are coming in at ChessPublishing.com. They are worth a look.